Microsoft has started to include windows desktop aligning capabilities in Windows 7, albeit basic in nature. Dragging a window to the right or left end of the screen will resize it so that it takes up half of the desktop space, the same can be achieved by pressing Windows-Right or Windows-Left on the keyboard while the window is active. But that is it. 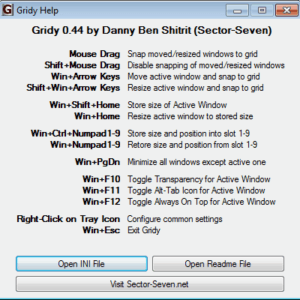 There is no option to align windows on a grid, or next to each other so that all space between the windows is used up. Neither is there an option to store window positions and sizes on the desktop. Gridy is a small portable software for Windows that adds additional aligning options to the Windows desktop. The application places an icon in the system tray. Clicking that icon displays the list of available options. The main feature is available right after startup. Windows will automatically align on an invisible grid, which makes it easier to align them next to each other. About a dozen additional options are provided, all of which are triggered with keyboard shortcuts. Windows can be moved by pressing the Windows key plus an arrow key on the keyboard. Users who add Shift to that keyboard combination can resize the window at the same time. The shortcut Windows-Shift-Home stores the size of the active window in the memory, and Windows-Home resizes the active window to that size again. The keys Windows-Ctrl-Numpad[1-9] stores the size and position of a window in memory, and Windows-Numpad[1-9] restores the window size and position again. Windows-F10 toggles transparency for the active window, Windows-F11 toggles the alt-tab icon and Windows-F12 makes the active window stay always on top. Gridy uses little resources while running. It is compatible with 32-bit and 64-bit editions of Microsoft Windows operating systems. We have tested it on Windows 7 Professional 64-bit and could not find any incompatibilities, the program worked as intended.